But time and time again, old school yearbooks are being dug up and thrown open - revealing treasure troves of comments and pictures the implicated would have preferred remained buried. Just look at the way the words of Supreme Court Judge Brett Kavanaugh's entry in his 1983 high school yearbook was poured over. Proof, his detractors argued, he was a liar. Proof, therefore, he should not be confirmed to the highest court in the US. Then there is the picture on Ralph Northam's page in his Eastern Virginia Medical School yearbook. The photo - a man in blackface, and another dressed as the Ku Klux Klan - is proof he is a racist, his detractors argue. Proof he should no longer be governor of Virginia. Either way, it didn't really matter. School yearbooks, it seemed, are no longer just a fun way of finding out what a film star looked like before they were famous. School yearbooks, it turns out, can destroy lives. 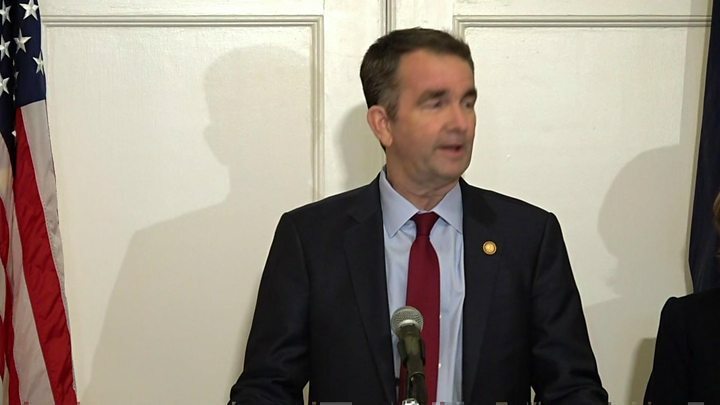 It didn't take long for newspapers and political opponents to start flicking through old yearbooks in search of more scandal after Gov Northam's blackface photograph emerged. The tradition is more than 200 years old, although the first "official" one - snappily called "Profiles of Part of the Class Graduated at Yale College, September, 1806" - had silhouettes rather than pictures. In the last week alone, the Daily Mail has uncovered pictures of people wearing KKK costumes "lynching" a man in blackface in the North Carolina governor's 1979 yearbook - although there is "no suggestion" Roy Cooper appeared in any of the tome's offending images. The New York Times trawled through more of Eastern Virginia Medical School yearbooks to find a catalogue of sexist and racist incidents. A Guardian report notes editions of Corks and Curls, the University of Virginia's yearbook, at least before the 1970s, were full of more of the same. But you don't have to be famous to be caught up in the furore over their contents. Those who are identifiable in the various controversial images have found themselves named and shamed in local media. In fact, you don't even have to have even left high school to find yourself in serious trouble over your yearbook photograph: look at the case of Hunter Osborn, an Arizona senior who ended up facing 69 counts of indecent exposure back in 2016. Why? Because he had exposed himself during a team photo for a dare - the same photo which was later included in the high school yearbook. "It's something that's going to be on his record for the rest of his life," Brooke Bodrero told local television. "The consequences are a little harsh." Thousands of people agreed: a petition to "free Hunter Osborn" - got almost 7,000 signatures. The petition writer, Alex Labban, put it simply: "Hunter needs to be held accountable for his actions but that doesn't mean ruining his life!" Prosecutors eventually decided to drop the charges - helped by the fact not one of the 69 "victims" of the alleged crime were actually prepared to press charges. The aforementioned Corks and Curls closed in 2009 because there was "not enough funding or student interest", The Guardian reported. Five years before Gov Northam's yearbook came to light, his alma Mata's current head, Dr Richard Homan ended the practice. He was, he said, concerned about how the 2013 edition - complete with Confederate flags and outfits - would be perceived. But then again, students today don't need to wait for their school yearbook to be uncovered for their careers and reputations to be damaged. The internet may have removed the need for yearbooks, but it means many of the photographs you may later regret can go viral - instantly. Take the boys from Baraboo High School in Wisconsin who were pictured apparently making the "Sieg Heil" gesture. The school district later said it could not establish what the boys were truly intending to do, CNN reported. All the same, people remember that picture - and it could well follow them around, as Stefanie Niles, president of the National Association for College Admission Counseling, noted last year.